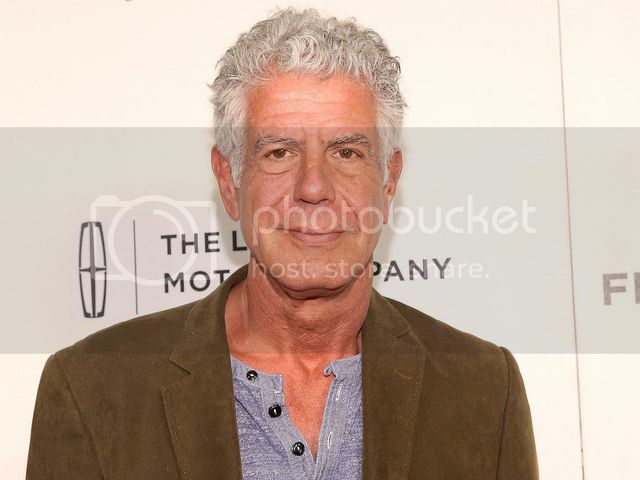 Anthony Bourdain of CNN "Parts Unknown"
Discussion in 'In Memory Of...' started by Karen#1, Jun 8, 2018. Anthony Bourdain was the host of CNN's "Parts Unknown"which was really a great program introducing the culture and food of different countries and cultures. He was a New York Chef who wrote the best seller "Kitchen Confidential" and even has his own publishing company. In 2014, 2015, 2016 He won the EMMY for best TV show and was the fierce competitor to Leah Remini ~~ many predicted he would win again, but Leah and Mike bested him. Today world wide media reported he hung himself in suicide in Northern France, dead at 61, while on location shooting a new episode. He leaves behind an 11 year old. What on earth can occur in the mind to permit someone suiciding like this? IN the middle of filming an Emmy award winning series and being on top of his game financially, celebrity wise and in popularity. Over the past 2 decades suicide rates have climbed dramatically. I try to remember this: Everyone you know is fighting a battle you know nothing about. This bums me out. I liked his shows a lot. I don't know what was going on in his head... but I suspect the craziness out there may have factored in. If you look at the world and have any type of sensitivity at all, what you see is going to bother you. (Anthony in his travels saw more than most people) How you deal with it is the key. Yes, Churchill. It's so tragic. Just the number of Scientologists who commit suicide on Hubbard's birthday is absolutely heartbreaking. From the outside, it looked like Anthony Bourdain had everything to live for. But suicide and mental illness prey on people from all walks of life and leave so much wreckage behind. I hope his loved ones find peace. Re bolded line (above) ... I've never heard anything about this ... and I don't believe it's true. Do you have more information please? The only case I know of is the one Liz Gale recounted to Leah Remini of her brother, Philip, an MIT progidy who took his own life on Hubbard’s birthday. Tory Christman has said that she personally knew of at least a dozen Scientologists who committed suicide. It’s possible that Whistleblower conflated these two things. I’d expect an unbiased study would discover that Scientology suicides occur at a far higher rate than in the overall population. Unfortunately, OSA continues to cover up Scientology’s involvement in suicides because of the “bad PR” they cause, as in the recent case of Catriona White. Oh! I had no idea so many scientologists had committed suicide ... but it was the idea that people were committing suicide on hubbards birthday that I was really querying. Mental illness does not discriminate and sometimes it wins. Churchill, after doing a little more research on this, you're right. I thought Tory had talked about many other suicides on Hubbard's birthday, but I was mistaken. I sincerely apologize for any confusion and I will be more careful in the future. It's looking more and more to me that he did not commit suicide. He was "Woke" and was showing a growing tendency to speak out by using his show's upcoming season as a platform. He had known Elon Musk for quite a few years but had recently became close friends with him. Musk educated him on the dangers of, and the powers that be's desire for, an increasing Artificial Intelligence world. Musk has been warning the world about this for several years. They had very recently been together in Morocco. Bourdain's closest friends have related that he was happier than he's ever been. Recently married and had a great relationship with his young daughter. Look for more information regarding this so-called suicide, most likely a murder, in the coming days....weeks....months. Oh, do I have docs to share? No. Not now anyway. Just a few items regarding Anthony Bourdain that is relevant to my post above. Earlier I said he had a new wife, actually he had a new girlfriend. I of course cannot say that I believe he was killed beyond a shadow of a doubt. Right now it just smells very fishy. A strong gut feeling. I will post more later, but only if I verify that the information is credible enough. He was not afraid to speak truth to power and if true he was getting ready to speak a lot more truth to power in the coming year. I did just read that his Mom has said that he had been in a dark mood over the past several days. But again, if what I've heard is true what he'd been finding out was very dark stuff. If also true then he had an interview with Elon Musk in the can for an episode to be aired later. Elon is another one who has never been afraid to speak out and has ruffled some big time feathers. **For those who don't know him, Ben Shapiro is a conservative editorialist. But that doesn't mean he is a Trump fan, because he is not. Oh, btw, Ben speaks very, very fast. I mean.....FAST! Lol... You can always slow the playback speed down. At the .75 rate he sounds more normal. I got 10 minutes through it, but then I had to stop. He sounds like a chipmunk and has no idea about depression, or how one feels when contemplating suicide. For Anthony Bourdain to have purposely left his child, he must have really thought the child would be better off without him. That's what depression does. It lies to you and it's good at it. For Anthony Bourdain to have purposely left his son, he must have really thought he (the son) would be better off without him. That's what depression does. It lies to you and it's good at it. Yes he sounds like a chipmunk. That's why I slowed it down and recommended others to slow it down. If you had gotten past ten minutes you would have heard him acknowledge the clinical depression aspect of suicide that needs real qualified treatment. Including medication if necessary. Overall he was addressing a gradual societal acceptance of suicide as being in itself a valid "moral choice". His concern is that this could lead to more suicides and in fact in the US records are being set this decade. He has obviously never suffered from depression so no he doesn't understand it the way you or I do, but he mentioned living with people who had clinical depression and he seems to understand how serious it is. to say if that's the case with him, but it's the first thing I thought of. changed them. Very disassociated with reality in some respects. Sad to see. A well known person who this happened to was Syn Barrett of Pink Floyd. He was a very extreme, permanently damaged case. he had a VERY rough go way back when and for a long time . . . so he'd said. Replying to my earlier post to say that the information that led me to have doubts that this was a real suicide did not pan out. In other words it wasn't credible. I was going to wait until tomorrow to be sure, but it's just so obviously bogus that I don't need any more confirmation.